There is grave reason to believe that much Bible reading and Bible study of the last few years has been of no spiritual profit to those who engaged in it. Yea, we go further; we greatly fear that in many instances it has proved a curse rather than a blessing. This is strong language, we are well aware, yet no stronger than the case calls for. Divine gifts may be misused, and Divine mercies abused. That this has been so in the present instance is evident by the fruits produced. Even the natural man may (and often does) take up the study of the Scriptures with the same enthusiasm and pleasure as he might of the sciences. Where this is the case, his store of knowledge is increased, and so also is his pride. Like a chemist engaged in making interesting experiments, the intellectual searcher of the Word is quite elated when he makes some discovery in it; but the joy of the latter is no more spiritual than would be that of the former. So, too, just as the successes of the chemist generally increase his sense of self-importance and cause him to look with disdain upon others more ignorant than himself, such, alas, is often the case with those who have investigated the subjects of Bible numerics, typology, prophecy, etc. The Word of God may be taken up from various motives. Some read it to satisfy their literary pride. In certain circles it has become both the respectable and popular thing to obtain a general acquaintance with the contents of the Bible, simply because it is regarded as an educational defect to be ignorant thereof. Some read it to satisfy their sense of curiosity, as they might any other book of note. Others read it to satisfy their sectarian pride. They consider it a duty to be well versed in the particular tenets of their own denomination and so search eagerly for proof texts in support of “our doctrines.” Yet others read it for the purpose of being able to argue successfully with those who differ from them. But in all this there is no thought of God, no yearning for spiritual edification, and therefore no real benefit to the soul. 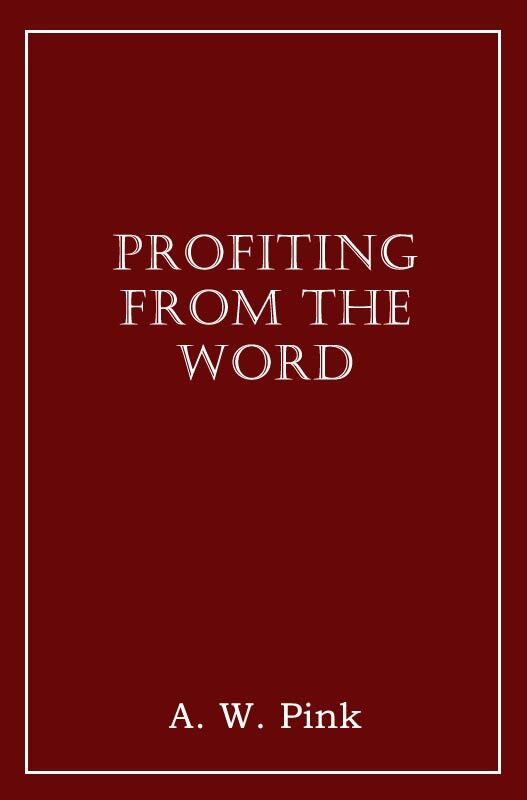 Of what, then, does a true profiting from the Word consist? Does not 2 Timothy 3:16-17, furnish a clear answer to our question? There we read: “All scripture is given by inspiration of God, and is profitable for doctrine, for reproof, for correction, for instruction in righteousness: that the man of God may be perfect, throughly furnished unto all good works.” Observe what is here omitted: the Holy Scriptures are given us not for intellectual gratification and carnal speculation, but to furnish unto “all good works,” and that by teaching, reproving, and correcting us. Let us endeavour to amplify this by the help of other passages. Appendix: Is Christ Your Lord?